JOHN AIELLO vs. PHILIP FORD, JR. and PAUL MURPHY, as Trustees of the PLYMOUTH RIVER CONDOMINIUM TRUST. The plaintiff, John Aiello, seeks by this Complaint to establish an easement, as appurtenant to his land on Washington Street in Weymouth, in the County of Norfolk, in and over a way adjacent thereto and to restrain the defendants from interfering therewith. The defendants have interposed several defenses, but the one they principally press is the contention that the plaintiff's use of the easement is conditional upon his use of the dominant tenement over which they appear to claim a veto power. Accordingly, they have refused to remove a fence which parallels the northwesterly boundary of the plaintiff's land and prevents access to the way unless they are satisfied with the plaintiff's projected use of his own land. A trial was held at the Land Court on September 23, 1988 at which a stenographer was sworn to record and transcribe the testimony. The plaintiff and the defendant Murphy were the only witnesses. All exhibits introduced into evidence, of which there were fifteen, are incorporated herein for the purpose of any appeal. The parties subsequently agreed, on the suggestion of the Court, that there be marked as Exhibit No. 15 a copy of a plan entitled "Plan of Lots in Weymouth, Mass." dated March 10, 1951, by Russell H. Whiting, recorded with the Norfolk County Registry of Deeds as Plan No. 260 of 1951 in Book 2987, Page 286. The question of damages was reserved for future determination.
" I. Plaintiff is an individual who resides at 27 Roosevelt Avenue, Hull, Massachusetts. 2. Defendant, Philip Ford, Jr., is a Trustee of the Plymouth River Condominium Trust and resides at 1272 D Washington Street, Weymouth, Massachusetts. 3. Defendant, Paul Murphy, is a Trustee of the Plymouth River Condominium Trust and resides at 1274 D Washington Street, Weymouth, Massachusetts. 4. The Plymouth River Condominium Trust is an organization of condominium unit owners duly organized, pursuant to Massachusetts General Laws, Chapter 183A, Section 10. 5. This controversy concerns a tract of land on Washington Street in Weymouth which originally contained approximately 139,000 square feet and was subsequently divided into five small lots, A, B, C, D, E, and one large back lot, as shown on a Plan by Russell H. Whiting, C.E., dated March 10, 1951 and recorded with the Norfolk County Registry of Deeds at Book 2987, Page 286. 6. Robert F. Smith and Dorthea A. Smith were the owners of the back lot and the newly created sub-dvidied (sic) lots when Lot "B" and Lot "C" were conveyed out by Deed dated March 1, 1954 and recorded with the Norfolk County Registry of Deeds at Book 3265, Page 63. 7. This Deed out contained the following language: 'For the benefit of both said first (Lot B) and second (Lot C) parcels, there is included herein for all purposes for which streets and ways may now or hereafter be used in the Town of Weymouth, the right to pass and repass over the premises shown on said plan as "Court" and extending northeasterly from Washington Street along the northwesterly boundary of the granted premises'. 8. The Plaintiff is the owner of a parcel of land known as Lot C by virtue of a Deed from Frank J. Baldassini, Joseph Baldassini and Philip Baldassini, Trustees of the JAF Realty Trust, to the Plaintiff dated December 31, 1986, recorded with the Norfolk County Registry of Deeds in Book 7395, Page 182, said parcel being shown on a plan by Russell H. Whiting, C.E., dated March 10, 1951 and recorded with the Norfolk County Registry of Deeds at Book 2987, Page 286. 9. 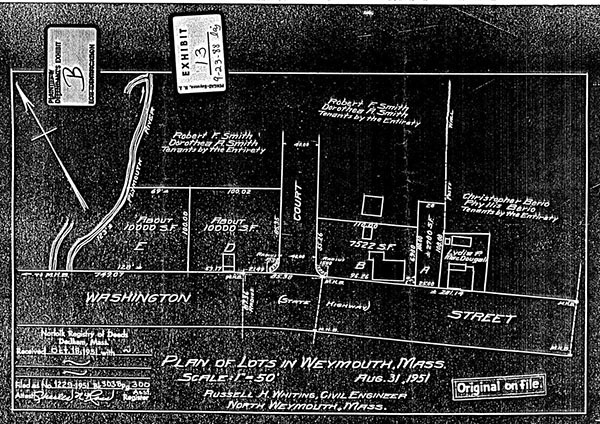 The Plaintiff's Deed to said Lot includes the following language: 'For the benefit of Lot C, there is included herein for all purposes for which streets and ways may now or hereafter be used in the Town of Weymouth, the right to pass and repass over the premises shown on said plan as "Court" and extending northeasterly from Washington Street along the northwesterly boundary of the granted premises'. 10. The Plaintiff is the owner of a parcel of land known as Lot B, by virtue of a Deed from Frederick A. Farina and Linda A. Farina to the Plaintiff dated December 10, 1986 and recorded with the Norfolk County Registry of Deeds at Book 7395, Page 181, said parcel being shown on a plan by Russell H. Whiting, C.E. dated March 10, 1951 and recorded with Norfolk County Registry of Deeds at Book 2987, Page 286. 11. 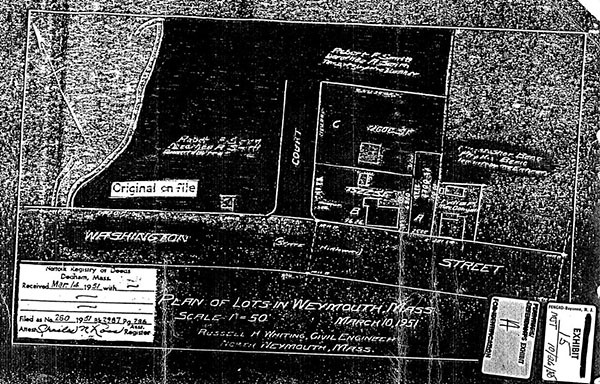 The Plaintiff's Deed to Lot B contains the following language: 'For the benefit of Lot B, there is included	herein for all purposes for which streets and ways now or hereafter be used in said Weymouth, the right to pass and repass over the premises shown on said plan as "Court" and extending northeasterly from Washington Street along the northwesterly boundary of the granted premises'. 12. The Defendant, Plymouth River Condominium Trust, acquired title to 'Court' by virtue of a Master Deed recorded in the Norfolk County Registry of Deeds at Book 6380, Page 605. 13. The northwesterly side of Plaintiff's Lot B abuts 'Court'. 14. The northwesterly side of Plaintiff's Lot C abuts 'Court'. 15. The Defendant, its servants, agents or employees, erected a fence running from the corner of Washington Street and 'Court' along the entire northwesterly side of the Plaintiff's Lots B & C, preventing ingress and egress from Lots B & C onto 'Court'. 16. The fence which surrounds the Plaintiff's property on its northwesterly and northeasterly sides was constructed by the Defendant in April of 1984." 17. The plaintiff's premises are situated in a Business District B-1. The plaintiff has had various proposals for development under consideration. At one time he applied for a special permit to conduct a body shop but withdrew his application without prejudice. Subsequently he obtained a building permit for the construction of a one story retail store (Exhibits Nos. 12, 12A and 12B), but to date neither his plans nor a proposed sale have come to fruition. 18. There have been discussions between counsel and the defendants concerning the removal of all or part of the fence, but no agreement ever was reached. The plaintiff agreed in the stipulated facts that the defendants had title to the so-called Court, shown on Exhibits Nos. 13 and 15 attached hereto. Otherwise it seems clear to the Court, and I would have so found, that the plaintiff's title extended to the middle line of the Court rather than merely to the northwesterly sideline of Lots B and C. See Casella v. Sneierson, 325 Mass. 85 (1950). General Laws, Chapter 183, section 58, Cf. Emery v. Crowley, 371 Mass. 489 (1976). However, the plaintiff does insist upon his right to use for all purposes the Court as shown on said plans and as specifically granted to his predecessors in title by the common grantors of his land and that of the defendants. Both by express grant and by the law of the Commonwealth, the plaintiff is entitled to use that portion of the Court which is co-extensive with the northwesterly boundary of Lots B and C and to enter the private way at any point along said sideline. Murphy v. Mart Realty of Brockton, Inc., 348 Mass. 671 (1965). The right to use the way runs with each part of the dominant tenement,	and accordingly the defendants had no right to block the plaintiff's access thereto by the erection of a fence. This was a wrongful act, and the refusal of the defendants to remove it upon demand under the pretext of a right to determine the use of the dominant tenement does not strengthen the defendants' case. The language of the easement contains no such limitation. If in the future the plaintiff uses the way in such a manner as to overburden his right, that will be sufficient time for the defendants to complain. I do not intimate, however, that the determination of the question depends on the use of the dominant tenement. Rather it is the plaintiff's use of the servient tenement which is controlling. The law is well settled, of course, that an express easement is not lost through mere non-use. Lemieux v. Rex Finishing Corp., 17 Mass. App. Ct. 417 (1979). Rather "it can be extinguished only by grant, release, abandonment, estoppel or prescription (Citation omitted). Lack of necessity and obsolesence do not affect the existence of this easement." Emery v. Crowley, supra, at Page 495. The defendants have also argued the defense of laches, but the plaintiff brought this action within a reasonable time after the fence was constructed, and no prejudice to the defendants has been shown. It is clear therefore that the plaintiff has, as appurtenant to Lots B and C, the right to use the Court adjacent to the entire length of his land to pass and repass for all purposes to and from Washington Street without interference from the defendants. The latter are permanently enjoined from interfering with the plaintiff's use and they, their agents, servants and employees, are hereby ordered forthwith to remove the existing fence and not otherwise to hinder in any way the plaintiff's exercise of his rights. The plaintiff and the defendants filed requests for findings of fact and rulings of law, but having made my own analysis thereof, I have not ruled specifically thereon.